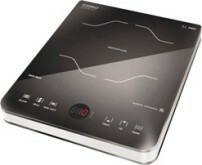 Single induction cooking field of 2000 W, with 10 power levels. It has Glass-ceramic surface and Sensor-touch operation. With brushed stainless steel frame and whisper-quiet fan. It has large digital display, and Timer, power levels and temperature are individually adjustable. It operates with booster - 30 sec. full power at 2000 watts, then the controller automatically returns to the pre-selected setting (e.g. 80°C). Timer function 1 - 120 minutes in 1-minute intervals. Temperature pre-selection adjustable to app. 60°C - 220°C. KeepWarm function will maintain a constant temperature and is used to keep your food warm at 70°C. It has safe operation due to automatic pan detection, automatic overheating protection and simple and easy cleaning.